The FIRMament is just that – FIRM! Sadly, for those who believe the same was as Doug, not only does history itself refute the gas/air/space expanse argument but so also do the Hebrew scholars who translated their Hebrew Scriptures into Greek for the creation of the Septuagint. But let’s deal with the first argument before diving deeper into the latter. Here we are told about a thing called the “firmament” which separates waters above from waters below. Not long after this, we are told the dry land appears within this firmament. Then, on Day 4 of Creation, we are told the sun, moon and stars are placed IN this firmament – not outside and all around as the Kent Hovind/Carl Baugh “canopy theory” would demand. 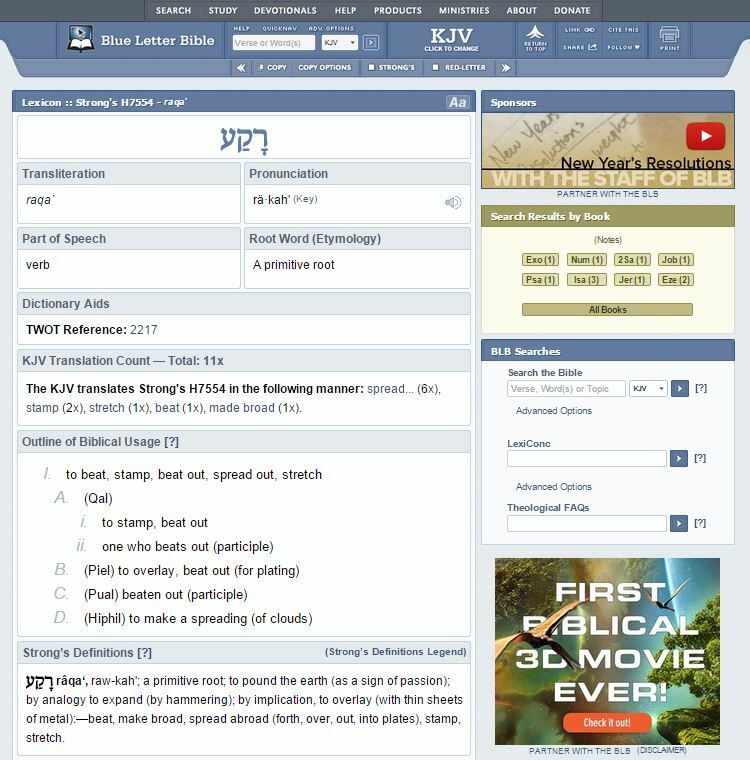 The Hebrew word used for the firmament in the above verses is preceded by the letter “bet” which means “in.” In fact, it’s the first letter of our Bible, used as a prefix for the word “beginning.” Hence we have: “IN the beginning…” So, in the Hebrew, you cannot get away from the fact that the sun, moon, and stars are all INSIDE this thing we call the firmament, not outside and all around some “ice canopy” suspended above the Earth! I deal with the issue of the “canopy theory” at about 7:20 in the above video. OK. Now, I want to circle back around (pun intended) to the issue of the firmament allegedly just being a gaseous/vacuum filled “expanse,” as many are desperately trying to convince us is the case today. 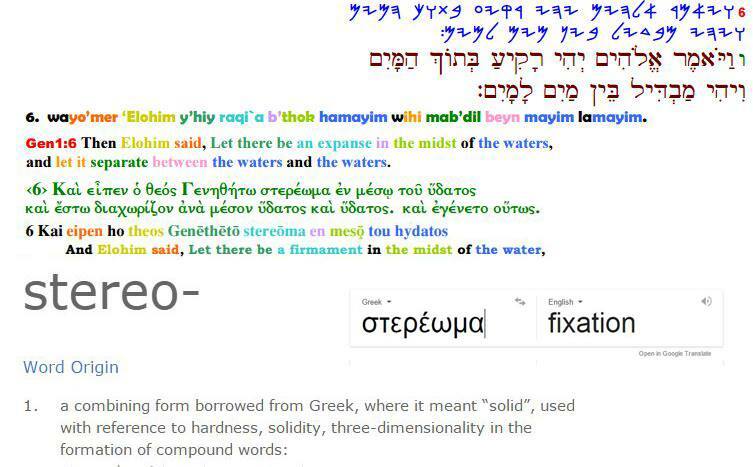 As you can see in the above graphic, I looked at the corresponding words for the firmament, then used an on-line translator and dictionary to discover the meaning of the Greek word “stereoma,” which the HEBREW scholars chose when they translated their Hebrew text into Greek. 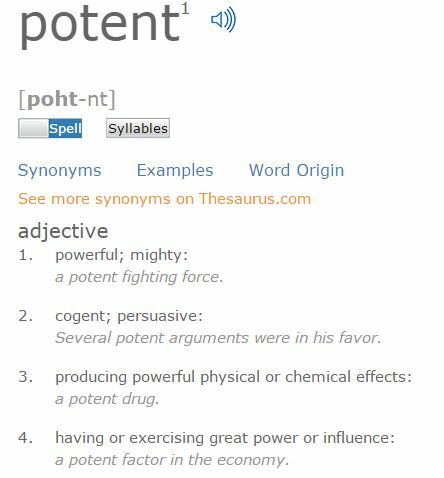 The word they chose conveys the meaning of something SOLID. No surprise there. The book of Job predates Genesis, and it just comes right out and tells you the sky is indeed firm. It’s not just some expanse of gas, eventually leading to the ever expanding vacuum of space. So, here we have the Hebrew scholars, conveying through the Greek text something that is powerful and mighty, which is fixed in place. How can you twist and manipulate that into any plausible description of gaseous air and the vacuum of space?? That’s wishful thinking of the highest order if you ask me. You’ll note also that the word “raqiya” comes from the word “raqa” (Strong’s # 7554), which does mean an “expanse” …but one that is “stretched” and “beaten out” as metal. Exodus 39:3 And they did beat the gold into thin plates, and cut it into wires, to work it in the blue, and in the purple, and in the scarlet, and in the fine linen, with cunning work. In fact, in all 11 cases where the word is used, it is in reference to stamping, beating, and stretching out something firm! In no way does the root word for firmament therefore even remotely support any notion of air and space. How do you beat and stamp atmospheric gas and a vacuum!?? No. Indeed, if we return back to Job, the explanation is made quite plain for us. Here Job backs the claim that the sky (i.e. 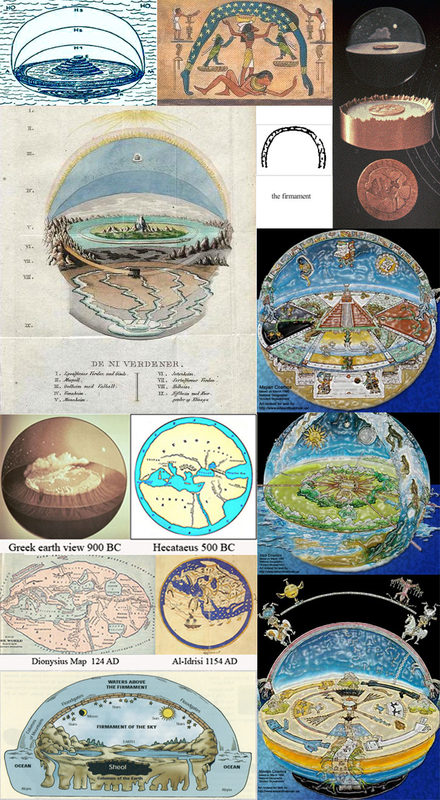 the firmament) was “spread out” (raqa) as a molten looking glass, which becomes like a mirror from having been beaten (raqa)! Sorry Charlie. But there is simply NO WAY you can force the “raqiya” in Hebrew or the “stereoma” in Greek – i.e. the “firmament” in English – into anything even remotely resembling the atmosphere and the vacuum of space. Nice try, but that’s just wishful thinking at best and totally delusional at worst. In Biblical cosmology, the firmament is the structure above the atmosphere, conceived as a vast solid dome. According to the Genesis creation narrative, God created the firmament to separate the “waters above” the earth from the “waters below” the earth. The word is anglicized from Latin firmamentum, which appears in the Vulgate, a late fourth-century Latin translation of the Bible. The word “firmament” is first recorded in a Middle English narrative based on scripture dated 1250. It later appeared in the King James Bible. The word is anglicised from Latin firmamentum, used in the Vulgate (4th century). This in turn is derived from the Latin root firmus, a cognate with “firm”. The word is a Latinization of the Greek stereōma, which appears in the Septuagint (c. 200 BC). 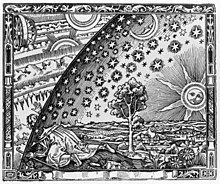 The Flammarion engraving (1888) depicts a traveler who arrives at the edge of a flat Earth and sticks his head through the firmament. 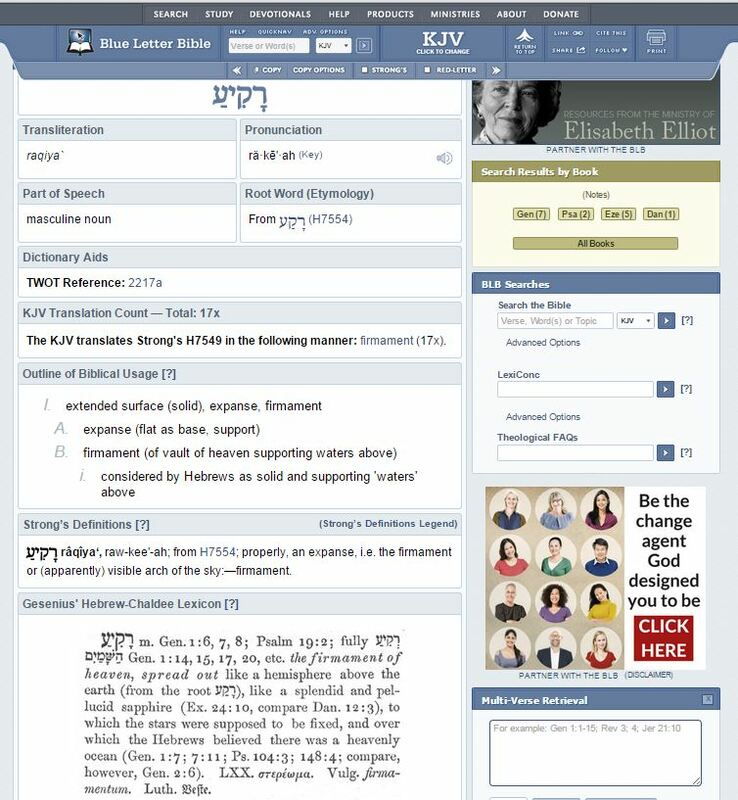 The word “firmament” is used to translate raqia, or raqiya‘ ( רקיע), a word used in Biblical Hebrew. It is derived from the root raqa‘ ( רקע), meaning “to beat or spread out”, e.g., the process of making a dish by hammering thin a lump of metal. The Copernican Revolution of the 16th century led to reconsideration of these matters. In 1554, John Calvin proposed that “firmament” be interpreted as clouds. “He who would learn astronomy and other recondite arts, let him go elsewhere,” wrote Calvin. “As it became a theologian, [Moses] had to respect us rather than the stars,” Calvin wrote. Calvin’s “doctrine of accommodation” allowed Protestants to accept the findings of science without rejecting the authority of scripture. As for the HUGE problems with the Doctrine of Accommodation, please read the blog I wrote on this subject. So in conclusion, it’s probably best to completely ignore those “scholars” who want to tell you that we should just dismiss the whole Biblical model of a flat Earth under a dome thesis as nonsense and embrace the ridiculous notion that the word “firmament” can simply mean clouds, atmosphere and space. Anyone who subscribes to such a notion is completely delusional and they are choosing to remain willfully ignorant of well established, historical facts, not to mention the understood meanings of words like “raqia” in Hebrew, “stereoma” in Greek and “firmament” in English. 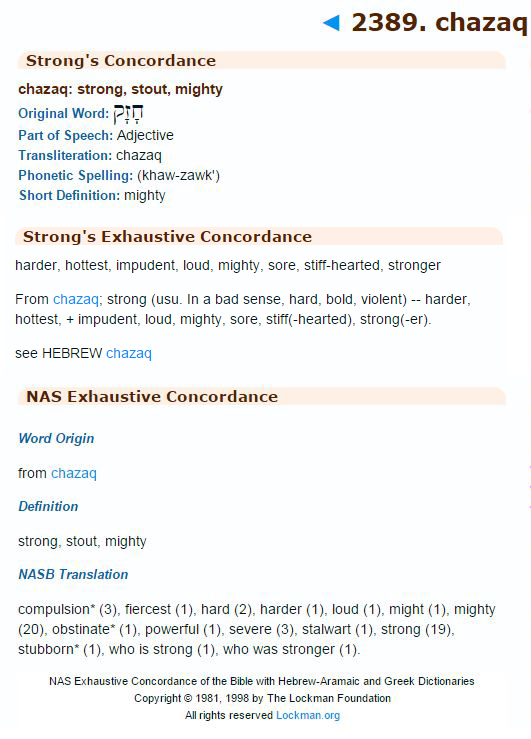 You realize that “how the hebrews regard…” something is not magically (kabbalistically?) proof of what the Bible ‘should’ mean right? If that’s all you got out of this, you clearly have reading comprehension problems. Might wanna work on that before further comment. Wonderful job Rob! Thanks for all you do and for laying this out so clearly. 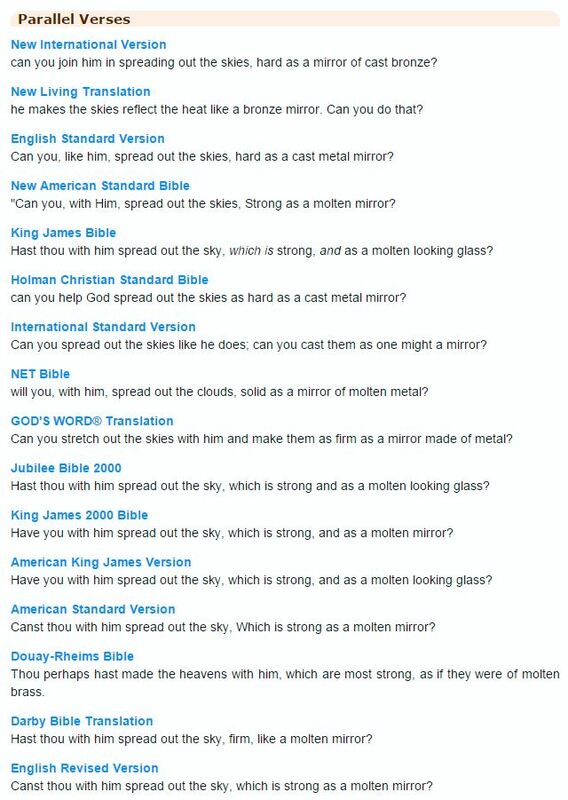 I’d just like to add that Psalm 148:4 mentions the ‘waters above the heavens’ and gives us further evidence that the Kent Hovind concept of a pre flood water canopy is not consistent with scripture. If I see the Firmament as a Dome glass of 10 meters and inside this 10 meters of glass the Sun as a moving light of 2 meters diameters, I’ll be right? Forgive my ignorance (only just delving into this subject), but could the sky be blue because the waters above can be seen through the firmament? Just had a quick skim through this as I am a follower of yours on the facebook website. Just thought I would add my bit of information as I have recently been reading the first chapters of the book of Genesis lately. It may be assumed that the breath of life was given to us through our nostrils which is correct. It was breathed into us. What is not so clear or evident here is “Has God breathed his own breath into us?” Strictly on an analytical basis, it can be said that God has breathed the breath of His Son into us as Christ IS the Truth, The Way & The Life. BUT, to stray away from simplicity which is considered a sin in any case, I personally think that “the breath of life” is the oxygen dome in which the earth has within the firmament and how all life and life forms breaths and gets to live. When it has been said that God breathed it into man, he simply gave us the oxygen that we needed to live. As for other unmentioned living beings, creatures or even molecular structures, all things are made through Him (Christ) and cannot live with Him, whether he she or it acknowledges this fact of life. Not relevant to the discussion of the Earth Heaven and Sheol but relevant to conclude, it will always be on this earth that sin will be a result of our death during the length of our days unless we are one of the unfortunate ones of John’s vision of being able to escape the first death but not being able to escape the second death which is to say the “hell fire”. Sorry, I should have mentioned, that it is probably worth reading chapter 2 forward to when it mentions Noah and the world flood. This I find adds perspective to the Godly view. Then where do the asteroids come from if there is any? In one of your videos you mentioned that back in the 60s they were sending probes to Mars and Venus even before the trip to the moon. Are these planets IN the firmament as stated biblically?? Everything is INSIDE the firmament according to Scripture, yes. Just because I’m fat, doesn’t mean I’m not firm! Sorry I haven’t commented in a while, I’ve been working out–glad to see some recognition!